Here's a few pics of Ted Scannell's bogie drive system using two Nigel Lawton 6mm diameter 6V micromotors, wired in series, and housed (a nice sliding fit) in a common 6mm i.d. brass tube. The motors drive the inner axle of each Bill Bedford bogie through silicone tubing and ball UJs, the UJs adjacent to the motor being 1mm o.d. 0.5mm i.d. 0.25mm wall thickness tubing with 1mm balls, and the UJs on the bogie using 1.5mm o.d. 0.5mm i.d. 0.5mm wall thickness tubing with 1.5mm balls, assembled as per Ted's construction notes. Gearboxes are Bill Bedford 14:1. This drive system is being developed primarily for tube train application. 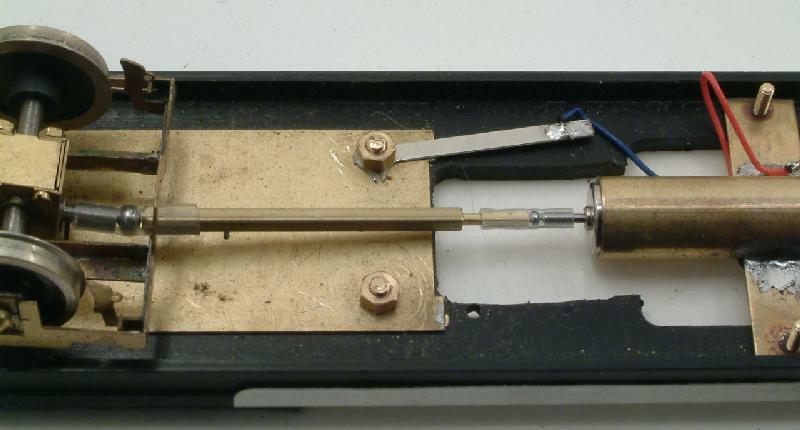 The outline of the two motors within the brass tube is shown dotted. 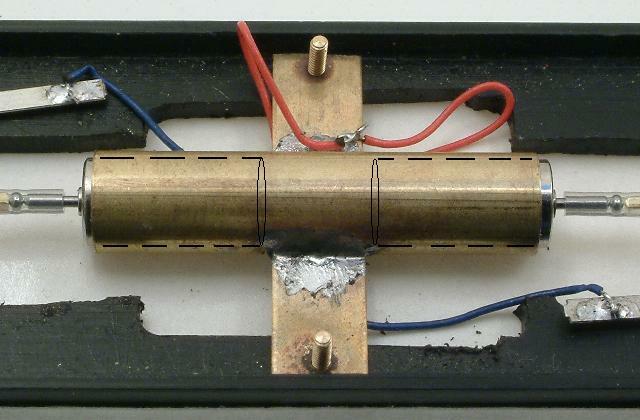 The brass tube is soldered to a chassis crossbearer, and has an aperture through which the motors' electrical connections are fed. The telescopic cardans are 0.8mm (1/32") square section sliding in matching thin-wall brass section.